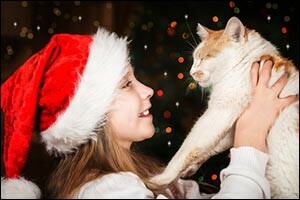 Are you thinking about adopting a pet this holiday season? Many people choose to adopt a brand new pet during this time of year, either as a gift for a child who has always wanted one, or just to add a new member of the family. Because there are so many animals looking for homes in the local shelters, it is a good idea to consider visiting a local facility right here in Southeastern Massachusetts or Rhode Island. While spaying and neutering is the best way to prevent an overload of unwanted pets in the South Coast area, it is still important to do what we can to help the pets that are stuck in shelter situations whenever we are able. Think about the type of pet that you would like to adopt before visiting your local shelter. You can speak with your local veterinarian about the activity level, needs, requirements and veterinary care in Massachusetts that you will need to provide for a dog or a cat to make sure that you can afford to do it right. These pets have been discarded at least once already, so it is important to give them all that you can – love, a nice home, regular veterinary check-up visits, proper nutrition and a safe place to sleep. Make sure you choose a cat or a dog that will fit in with your schedule and your lifestyle. You want to make a good match that will last for the rest of the animal’s life. Make sure to bring your new pet in for a veterinary check-up at your local Dartmouth vet. Vaccinations, spraying and neutering, dental care for pets and more can all be taken care of at Anchor Animal Hospital. Make sure to take your new pet to the vet right away before bringing them around other pets at your home, just to make sure they have a clean bill of health. A single “getting to know you” scratch or bite from a new kitty or puppy can cause health risks in other pets and people too. If the pet is not spayed or neutered, schedule a visit to determine if the new pet is healthy enough for surgery. The more you can do to prevent more kittens and puppies from flooding the local area, the better. There are a lot of areas throughout Rhode Island and Southeastern Massachusetts that do not have immediate accesss to an animal shelter or agency. However, there are a lot of fantastic local rescue organizations that you can turn to for adoptions. Some are breed specific, while others will take any type of pet that is turned over to them. One way to find a good place to adopt is to work with your local veterinarian. Because they provide a wide range of services for veterinary care in Massachusetts, they often come in contact with these rescue groups and can share their experiences with potential adopting families. If you find a rescue that has the type of cat, dog or other pet that you are looking for, make sure to visit the facility. See where the pets are being kept, ask for veterinary check-up records and make sure that you choose the pet that is right for you. While most people think they want a tiny puppy or kitten, there are many advantages to choosing an older pet that is already house-broken and trained not to chew on your furniture. Make sure you select a pet that reflects your lifestyle, whether you are active and athletic or more of a home-body. Always make sure to ask about the breed of the pet to make sure it won’t get “too big” for your apartment, condo or house. It isn’t fair to the pet to be rejected just because they got bigger than you thought they would be when they grew up. Do your own research as well and make sure you and your new pet are a good match. In addition to bringing a pet into your home during the holidays, when many shelters are over-flowing and pets are in need of human companionship the most, there are other seasonal pet tips that can help you. Make sure to spay or neuter your own pets to prevent contributing to the over-population of unwanted animals in your local area. Encourage friends and family members to do the same. You can also contribute to local rescues and shelters that provide spay and neuter services at a discounted rate to low-income families who otherwise might not be able to afford the surgery. Experts estimate that for every dog or cat that is spayed or neutered, it prevents somewhere between four and ten unwanted pets. Bring your pet in for an annual veterinary check-up at Anchor Animal Hospital in Dartmouth. We provide a wide range of services for veterinary care in Massachusetts, including dental care for pets, spaying and neutering, basic veterinary check-up, emergency veterinary services, preventive services and much more. Give us a call at 508-996-3731 to schedule an appointment or to learn more about the services that we provide.